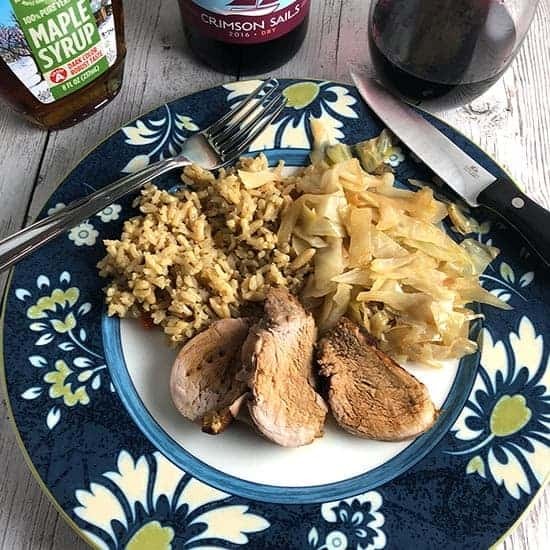 Maple Pork Tenderloin recipe features savory pork tenderloin with a bit of sweetness from a maple syrup based marinade and sauce. Delicious with a red wine from Vermont. Yes, wine from Vermont! This Maple Pork Tenderloin recipe was inspired by a trip we to to Vermont this past October. Our destination was Shelburne Vineyard, located just south of Vermont. I was thinking about something to make to pair with the fruit forward Crimson Sails red blend from Shelburne Vineyard. 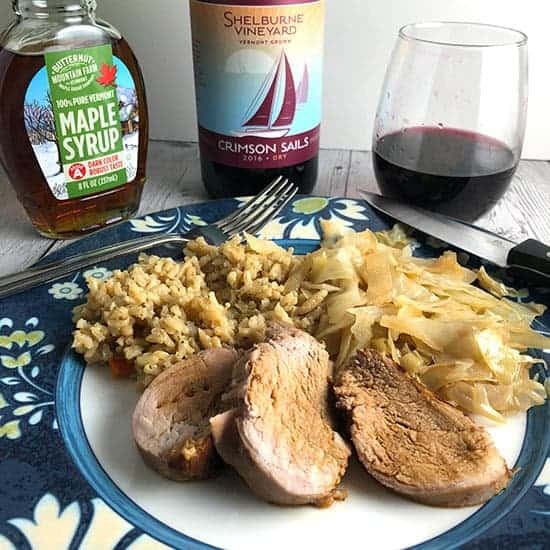 Pork tenderloin came to mind, and I figured why not flavor it with maple syrup, one of Vermont’s signature products. We were very pleased with the results! The Maple Pork Tenderloin is a nice combination of savory and sweet. The tender meat was good with a side of and a side of cabbage. Definitely very good with the wine too! More on that in a moment. First we need to make the Maple Pork Tenderloin! Pork tenderloin is one of my favorite meats. The relatively delicate flavors provide an opportunity to showcase your sauces. We recommend one to two hours of marinating time for the Maple Pork Tenderloin, but 20 to 30 minutes is fine if you want to get this on the table in an hour. We tested the shorter marinating time during a recent remake of the recipe and it was still very tasty. The marinade is quite straightforward. Just get all the marinade ingredients together, then toss with the pork tenderloin. If you are doing the one to two hours of marinating, most of that will be in the fridge. Pull the pork out when you start preheating the oven to finish marinating at room temperature. The cooking time for pork tenderloin varies a lot depending on the size of the pork and your oven. A smaller tenderloin is likely to be done around 15 minutes. The other night, with a tenderloin about one pound exactly, it was ready after 20 minutes plus resting time. You don’t want to overcook the pork! You can make the sauce as the maple pork tenderloin roasts. When using reserved marinade as we do here, but sure that the marinade boils for at least five to ten minutes for food safety purposes. 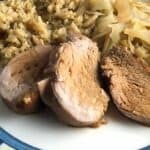 When your Maple Pork Tenderloin is done, slice it up and enjoy! As I noted, this was good with a brown rice pilaf and sautéed cabbage. As I said, the Maple Pork Tenderloin started with the wine in mind. 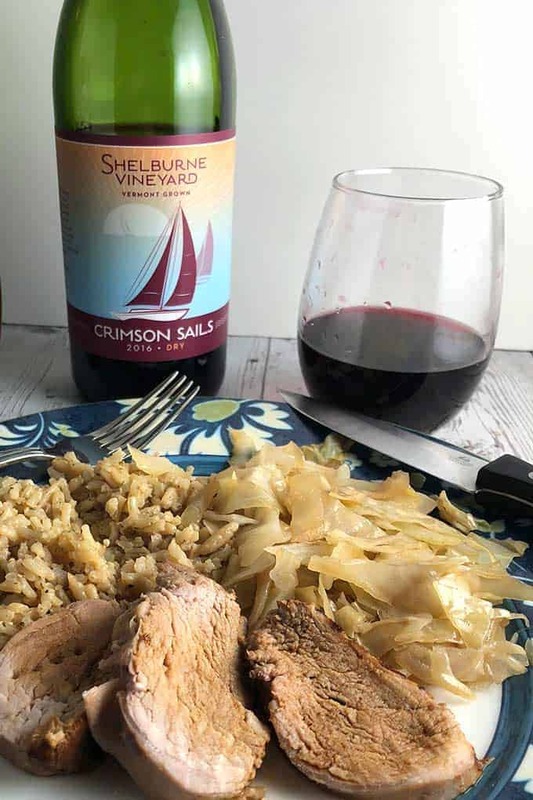 The 2016 Shelburne Vineyard Crimson Sails (14.8%, $17) is a blend of Marquette (73%) and Petite Pearl (27%). These are two northern climate grapes I’m guessing you might not have heard about! They are both hybrids developed to withstand the cold temperatures of northern wine regions like Vermont. Aged in stainless steel, this wine is fruit forward–I get blackberry–with plenty of substance. Reminds me a bit of a Gamary (Beaujolais). The Crimson Sails is definitely great paired with the Maple Pork Tenderloin! Unless you live in Vermont, you aren’t likely to find the Shelburne Vineyard wines at your local shop at this point. They do ship their wine to a decent number of states — visit their website shop to see if you are in luck! 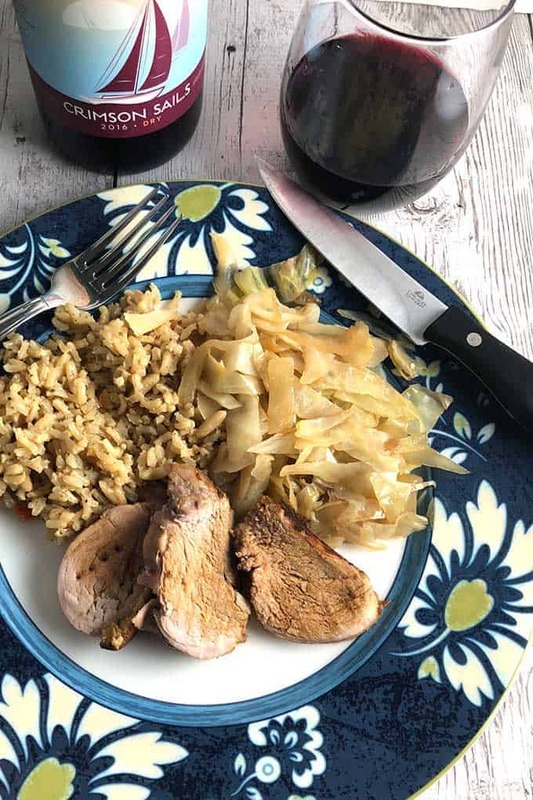 If you don’t manage to track down the Crimson Sails, Pinot Noir is a suitable alternative we have tested with the Maple Pork Tenderloin. I suspect Gamay could work too. For more on our visit to Shelburne Vineyard, visit this article. Savory pork tenderloin with a bit of sweetness from a maple syrup based marinade and sauce. Delicious with a red wine from Vermont! Combine the marinade ingredients, maple syrup through the olive oil, in a medium sized bowl. Remove the pork from the refrigerator 15 minutes prior to cooking. Preheat the oven to 400 around the time you take the pork out of the fridge. When the oven is heated, remove the pork from the marinade, gently shaking the excess marinade back into the bag. Place the pork in a roasting in pan, and put in the over to roast for 15 to 20 minutes. Make the sauce as the pork roasts. Pour the excess marinade from the bag into a small sauce pan, and add the remaining sauce ingredients–3 tablespoons maple syrup through chicken broth. Bring to a boil, then reduce to a gentle boil for 10 minutes, stirring occasionally as the sauce thickens. Keep warm as the pork finishes cooking. Check the pork for doneness at 15 minutes of roasting time. Pork tenderloin should be 145 degrees internal temperature and still juicy and moist when done. A pork tenderloin one pound or more may take 20 minutes or more but checking at 15 avoids overcooking. When the pork is cooked, remove from oven and place the pork tenderloin a platter to rest for a few minutes. Slice the pork tenderloin, and serve drizzled with a bit of sauce. Pass extra sauce at the table. Enjoy! I give the roasting time for pork tenderloin as 15 to 20 minutes. Your actual time will vary based on your oven and size of the pork. Be sure not to overcook the pork! As explained in this post on The Spruce, cooking pork to medium (145 degrees) is perfectly safe and much tastier than well-done meat. Tenderloin is one of my favourite cuts and I love the use of maple syrup too. Delicious! You had me at maple – one of my favorite flavors! I love the wine pairing, too. Thanks for sharing! what amazing flavors! love the maple and soy combo you used. this would be a great valentines day meal. I would never have thought that wine fron Vermont would be good, but I will take your word for it. Looks like a great recipe. I was surprised to hear there is a winery there producing top quality wine, but Shelburne is doing great stuff! The marinade for this sounds wonderful. Love all the flavors here. Wow that marinade looks tasty…and we’ve yet to drink wine from Vermont so will definitely be on the lookout! It’s very good, different that what one typically sees in the shops. Yum this sounds delicious and the wine sounds extremely interesting, I’ve never come across those grape varieties before! First, I would never have expected that you could cook pork tenderloin so quickly! I expected that it would need to slow cook for hours! (we obviously don’t cook much pork tenderloin in our house, but now that may change). And then you said “fruit forward” when speaking about a wine from Vermont. That had me intrigued. I will be researching the hybrids, as, yes indeed, I have never come across them before! Thanks for sharing this! Hi Robin–you may be thinking of pork loin, which does typically require longer / slower cooking. Pork tenderloin is thin and cooks quickly; it is quite lean. Yes, these wines from Shelburne are interesting and very good, definitely a change of pace.